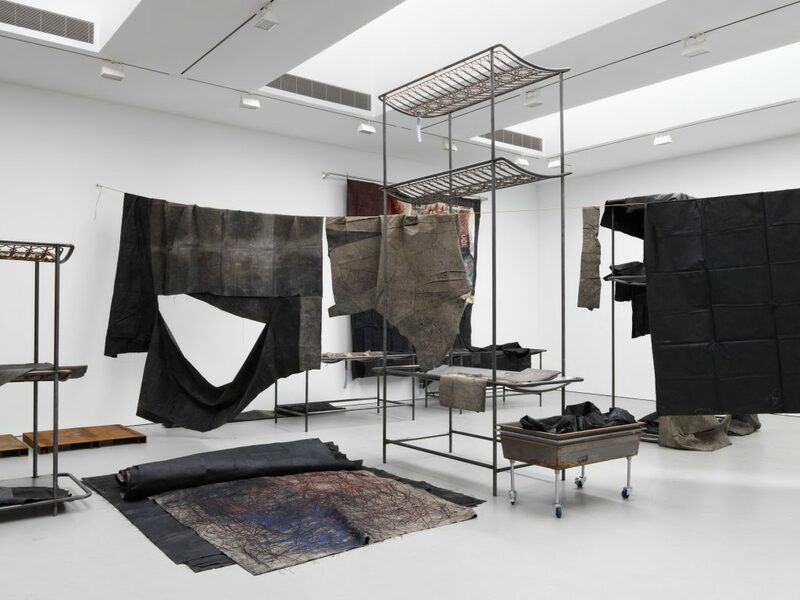 In a futile mercantile disposition, a maze-like room-sized installation of several hundred black paintings and steel structures inspired by morgue tables, the idea of a finished work becomes inseparable from process and materials. 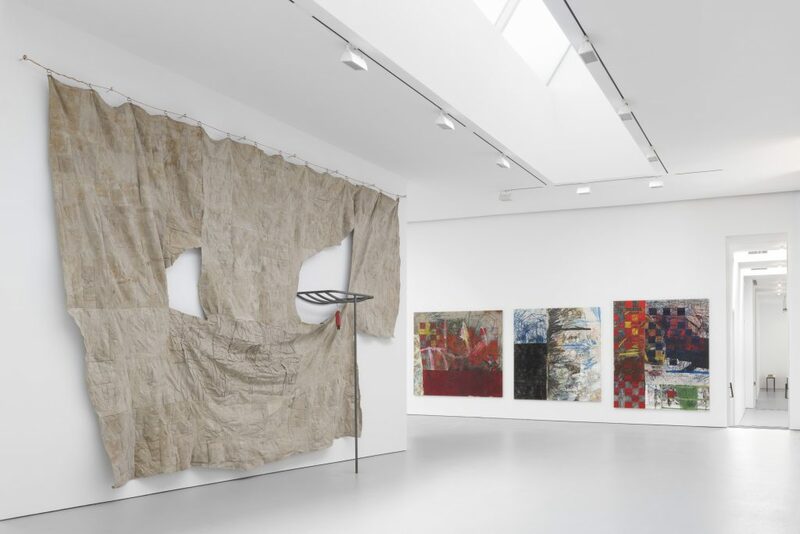 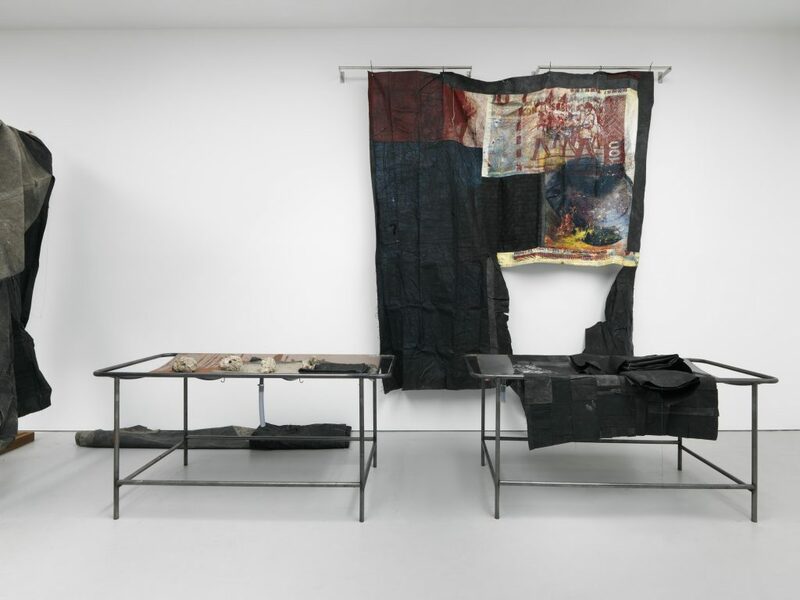 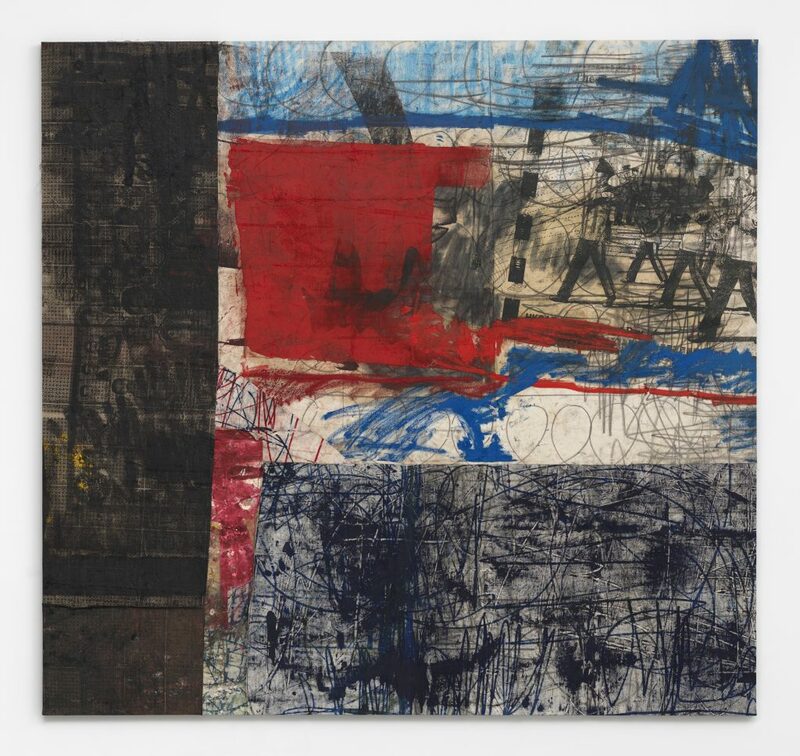 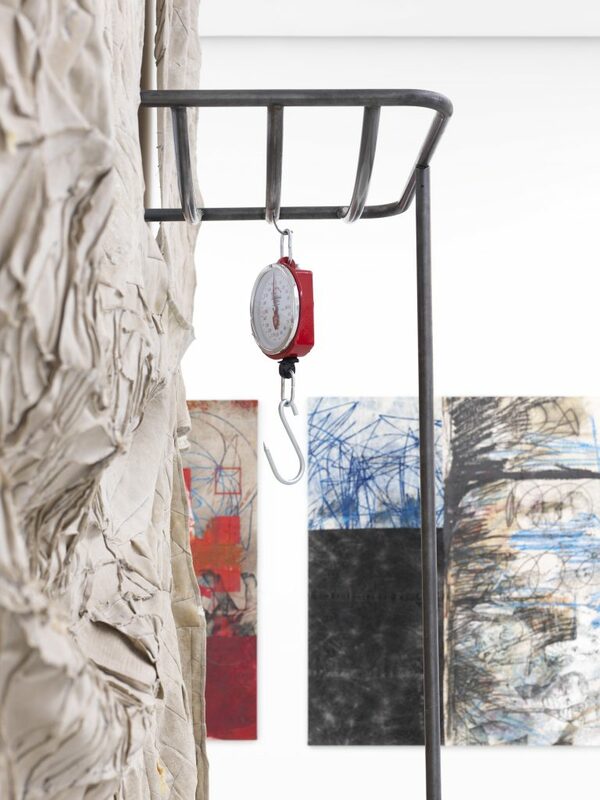 Each of the canvases has been covered with two coats of paint on both sides and is displayed draped across metal wires, folded, or casually scattered. 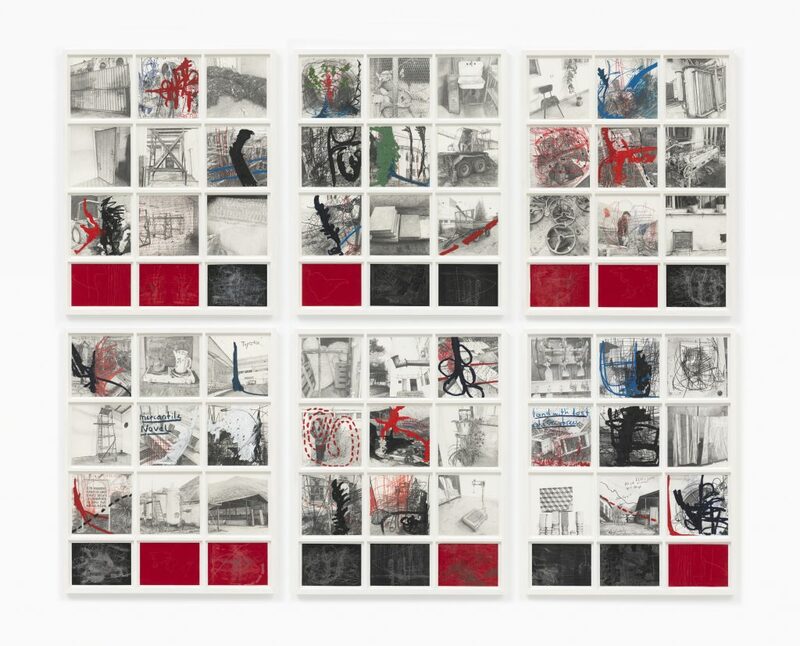 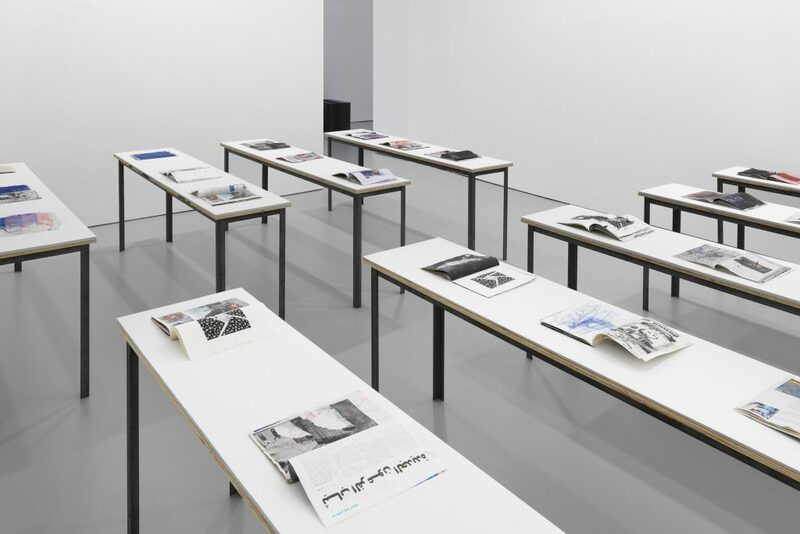 Not two are alike: some have been cut into strips and sewn together in a unique pattern, while others bear evidence of previous use as oil pads in the studio, with marks left behind by other works, or of having moved around with the artist on his travels. 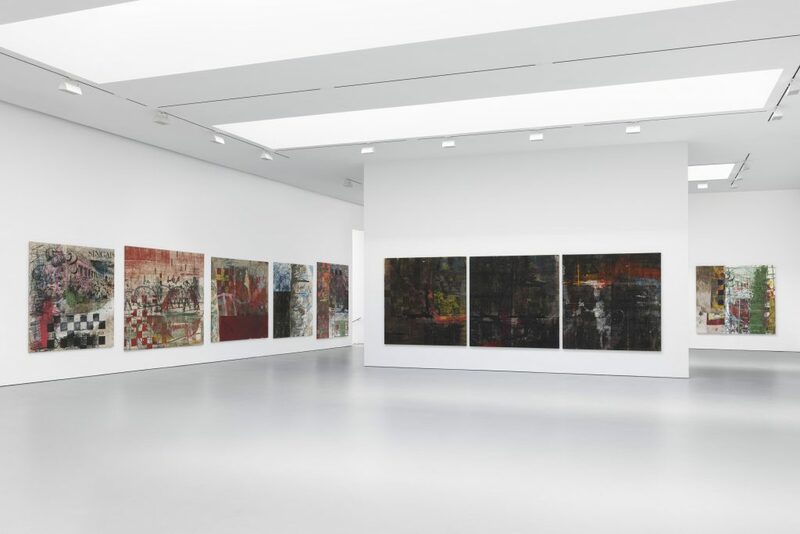 Alternating sheer and opaque surfaces distinguish newer canvases from older ones, and the lingering smell of paint offers a sense of their ongoing production. 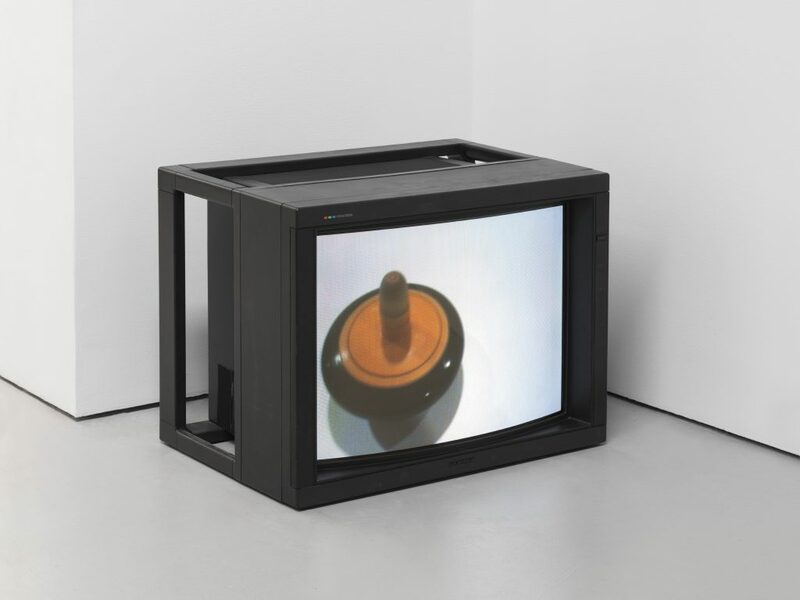 A monitor displaying a silent video of a spinning top in perpetual motion is positioned as a catalyst activating the space. 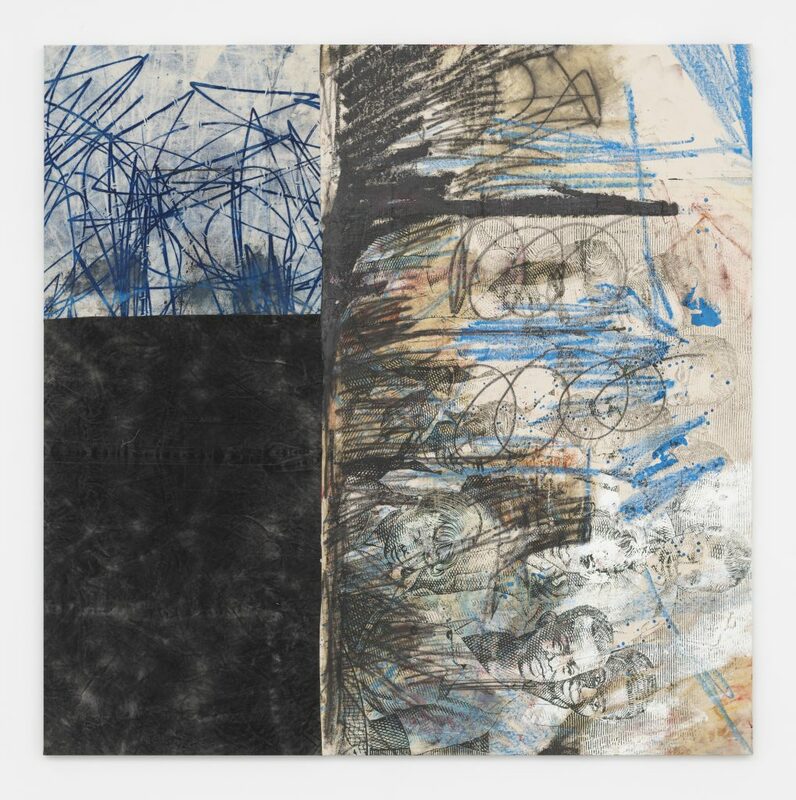 The element of patchwork is more clearly visible in another group of paintings on view, which represent a continuation of the vibrant and visually complex works for which Murillo first became known. 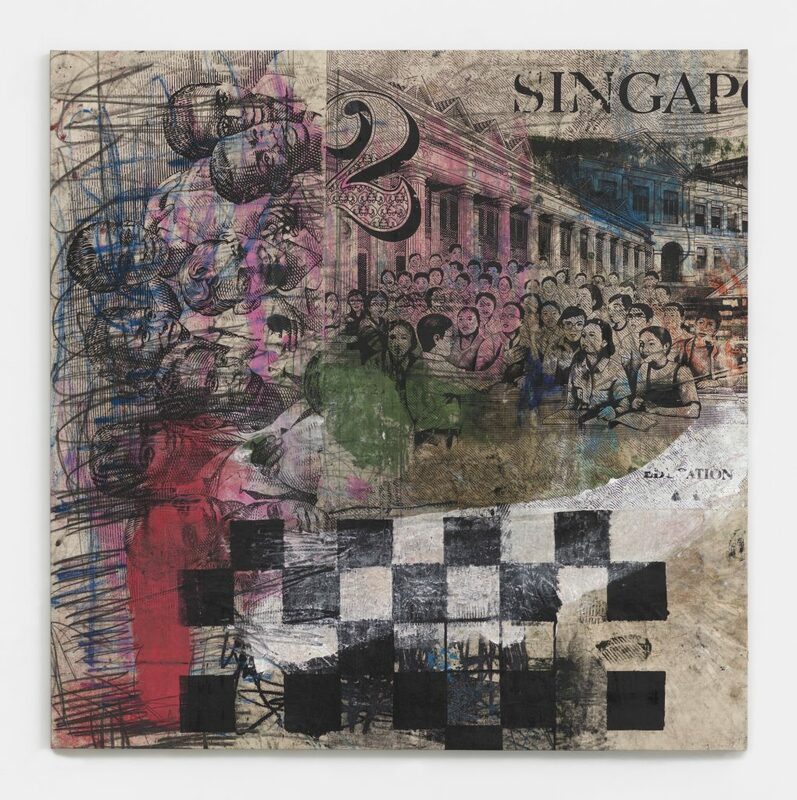 Including multiple layers of marks from repeated brushwork and printing, they contain recognizable, if jumbled, imagery drawn from such sources as a Jamaican two dollar bill, playing cards, coconut water packaging, and a Colombian animal feed wrapper. 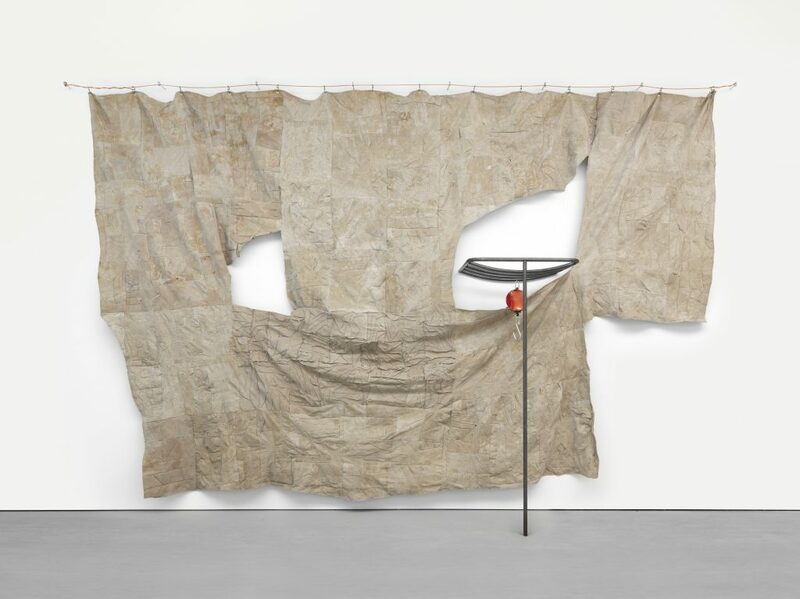 In contrast, through patches of corn, wheat and mud, a large-scale and partially torn painting that shares its title with the exhibition, is devoid of figuration, focusing attention fully on its intricate pattern of canvas fragments that are covered with natural latex and minutely stitched together. 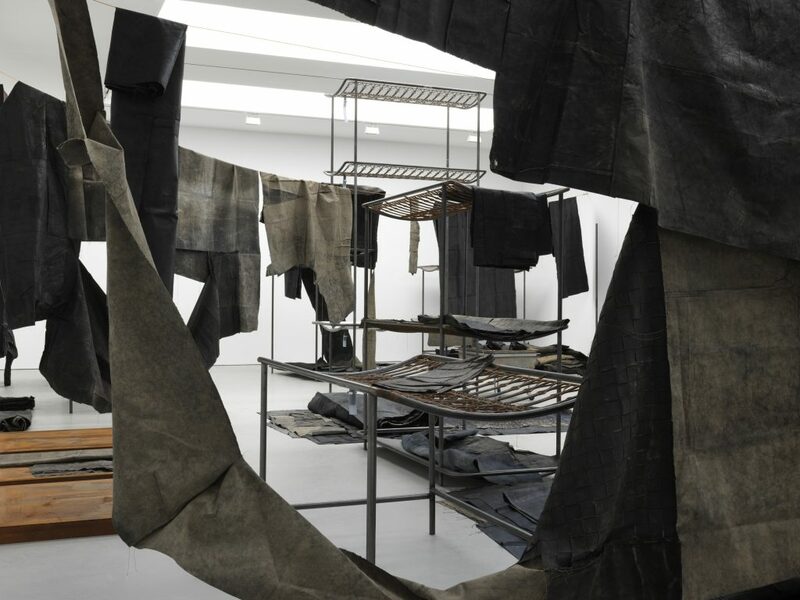 Installed with a metal armature similar to the sculptural arrangements in a futile mercantile disposition, it offers the impression of a sturdy landscape to be traversed. 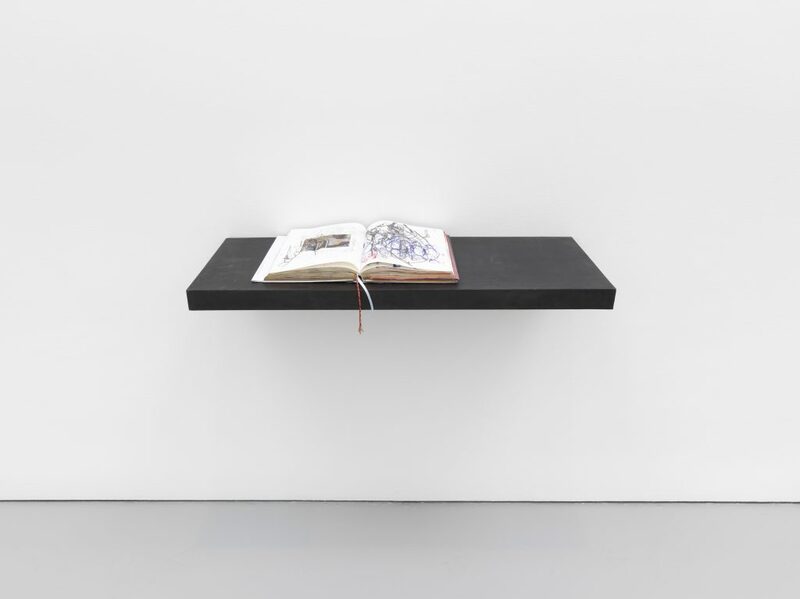 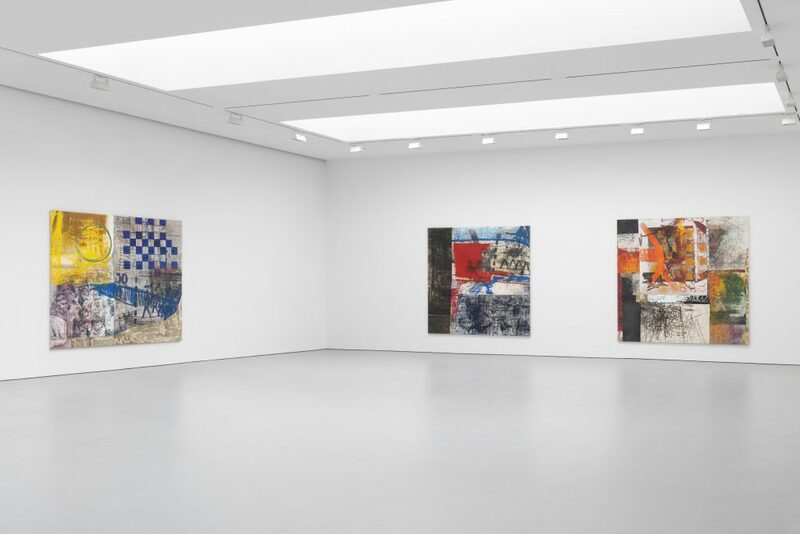 Installation view of Oscar Murillo ‘through patches of corn, wheat and mud’ at David Zwirner, New York 2016.